A 30-year-old gorilla lives in a cage on the seventh floor of a high-rise department store in downtown Bangkok, Thailand. Bua Noi, which means Little Lotus, isn’t the only animal there — though she might very well be the saddest. She lives all alone in her barred enclosure at Pata Zoo, which also apparently holds orangutans, chimpanzees, monkeys, leopards, reptiles and birds in cages on top of the shopping complex and is accessed via an elevator. For years, animal activists have been trying to shut the place down. In 2015, there were reports that authorities finally recognized how abhorrent the zoo was for the animals who lived there. It seemed that things were finally going to change. But because there has been no official animal welfare legislation in Thailand until recently, changing the fate of animals like Bua Noi remains complicated. Some activists argue that the legislation that was passed for animal welfare is too vague to affect much change anyway. But when the headlines grew stale and the spotlight on the cruelty dimmed, it never became clear whether the animals were rescued, and if they were, where they ended up. Photos posted online since then, by zoo visitors, appeared to tell a different story — that the animals remained locked up in the shopping mall. As recently as a few months ago, Bua Noi appeared to be locked behind the same bars that have held her captive since she was a baby. It’s said that Bua Noi was born in the wild, then captured, and has been behind bars ever since. She’s been on display at Pata Zoo since 1987. Now a new petition has surfaced, demanding the gorilla’s release. It shows a picture of Bua Noi, captioned that it was taken in November of this year. The Dodo received confirmation that Bua Noi is still in the shopping mall. “Little Lotus (Bua Noi) is definitely still there,” Jodie Broad, who penned the latest petition, told The Dodo. A friend of Broad’s went to the zoo three weeks ago and snapped the updated photo of Bua Noi. Broad recently met with Sinjira Apaitan, an advocate for Bua Noi in Thailand, who is fighting for better living conditions for all the animals at the Pata shopping mall zoo. Sinjira and Broad met with government officials last May about bettering the conditions for the animals. “But nothing was resolved,” Broad said. Gorillas are highly social and intelligent animals, but Bua Noi has nothing to do in her cage, and no companions to keep her company. 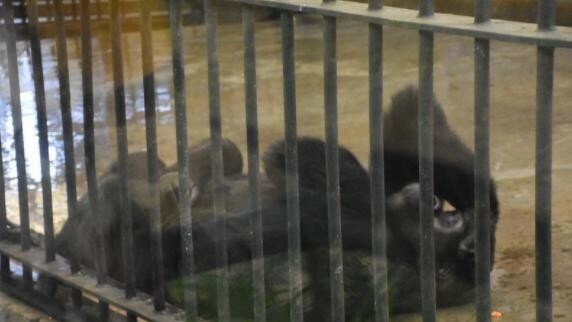 The director of the zoo, Kanit Sermsirimongkhon, has said that he hasn’t done anything wrong. He has said that he started the zoo 30 years ago because he loves animals. To add your name to a petition calling for the release of Bua Noi, click here. The Dodo will continue to follow Bua Noi’s story and will update this story when we have more information.